Cloudy early with partial clearing expected late. Slight chance of a rain shower. Low 58F. Winds W at 5 to 10 mph. 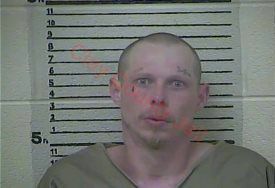 On April 15, 2019 at approximately 10:30 AM Clay County Sheriff Patrick Robinson along with Clay County Sheriff Deputy Cody Blackwell arrested Sampson Swafford, 32 of Roots Branch Road. The arrest occurred on Highway 80 when Sheriff Robinson and Deputy Blackwell was dispatched to a complaint of a possible domestic walking alongside the road. Contact was made with a male and female subject on Highway 80 which there was no signs of a fight, the male subject was arrested. The photo attached is courtesy of the Clay County Detention Center.